Increased demand for academic credentials and the growing risk and insecurity in the employment market over the past few decades have had a profound effect on young people. The majority of scholars in the field share the observation that these neoliberal trends lead to prolonged and more complex youth transitions (Bradley H, Devadason R. Sociol 42(1):119–136, 2008; du Bois-Reymond M. Models of navigation and life management. In Furlong A (ed) Handbook of youth and young adulthood new perspectives and agendas. Routledge, Oxon, pp 47–54, 2009; Furlong A. Handbook of youth and young adulthood. New perspectives and agendas. Routledge, London, 2009; Heinz WR. Youth transitions in an age of uncertainity. In Furlong A (ed) Handbook of youth and young adulthood new perspectives and agendas. Routledge, Oxon, pp 19–29, 2009). Yet, their opinions diverge regarding the implications of the changing nature of transitions. One camp argues that these conditions lead to more individualized transitions, lessening the impact of structures and compelling young people to “navigate” their own pathways and assert agency (Beck U. Risk society: towards a new modernity. Sage, London/New York, 1992; Beck U. British J Sociol 58:679–705, 2007; Giddens A. Modernity and self-identity: self and society in the late modern age. Stanford University Press, Stanford, 1991). In the other camp are scholars, such as Côté (Côté J. J Youth Stud 17(4):527–543, 2014a; Côté JE. Youth studies: fundamental issues and debates. Palgrave Macmillan, Houndmills, 2014b), who argue that youth have become even more vulnerable and forced to depend more heavily on social and institutional structures. Many other researchers position themselves somewhere between these camps, pointing to both the persisting roles of structures and increasing individual creativity in navigating transitions (Evans K, Furlong A. Metaphors of youth transition: niches, pathway, trajectories or navigations. In Bynner J, Chisholm L, Furlong A (eds) Youth, citizenship and social change in a European context. Aldershot, Hants, Ashgate, 1996; du Bois-Reymond M. Models of navigation and life management. In Furlong A (ed) Handbook of youth and young adulthood new perspectives and agendas. Routledge, Oxon, pp 47–54, 2009; Furlong A. Handbook of youth and young adulthood. New perspectives and agendas. Routledge, London, 2009). Barely accounted for in this discussion, however, is the experiences of immigrants’ descendants. This is a blatant omission, considering that ethnic minority youth, as they are often called, comprise one of the largest groups in today’s diverse cities and are statistically recognized as among the most vulnerable. While ethnic and migration studies and social stratification research focus on how this group integrate within the education system and labour market, neither research paradigm has yet explored how immigrants’ descendants experience the process of youth transition. As this book has demonstrated, transition experiences presage the future of these groups in society and, considering how large the group is, this will have broader social implications. This study was inspired by seminal debates in youth sociology concerning new forms of transitions. It is my aim to contribute to this debate by exploring the case of native-born descendants of Turkish immigrants—now one of the largest ethnic minority youth groups—in Western European cities. The findings of the study, which analyzes the role of social structures—social class, gender and ethnicity—in shaping youth transition processes across different institutional settings in Amsterdam and Strasbourg, has relevance for both camps of scholarship. Increased demand for academic credentials and the growing risk and insecurity in the employment market over the past few decades have had a profound effect on young people. The majority of scholars in the field share the observation that these neoliberal trends lead to prolonged and more complex youth transitions (Bradley and Devadason 2008; du Bois-Reymond 2009; Furlong 2009; Heinz 2009). Yet, their opinions diverge regarding the implications of the changing nature of transitions. One camp argues that these conditions lead to more individualized transitions, lessening the impact of structures and compelling young people to “navigate” their own pathways and assert agency (Beck 1992, 2007; Giddens 1991). In the other camp are scholars, such as Côté (2014a, b), who argue that youth have become even more vulnerable and forced to depend more heavily on social and institutional structures. Many other researchers position themselves somewhere between these camps, pointing to both the persisting roles of structures and increasing individual creativity in navigating transitions (Evans and Furlong 1996; du Bois-Reymond 2009; Furlong 2009). Barely accounted for in this discussion, however, is the experiences of immigrants’ descendants. This is a blatant omission, considering that ethnic minority youth, as they are often called, comprise one of the largest groups in today’s diverse cities and are statistically recognized as among the most vulnerable. While ethnic and migration studies and social stratification research focus on how this group integrate within the education system and labour market, neither research paradigm has yet explored how immigrants’ descendants experience the process of youth transition. As this book has demonstrated, transition experiences presage the future of these groups in society and, considering how large the group is, this will have broader social implications. This study was inspired by seminal debates in youth sociology concerning new forms of transitions. It is my aim to contribute to this debate by exploring the case of native-born descendants of Turkish immigrants—now one of the largest ethnic minority youth groups—in Western European cities. The findings of the study, which analyzes the role of social structures—social class, gender and ethnicity—in shaping youth transition processes across different institutional settings in Amsterdam and Strasbourg, has relevance for both camps of scholarship. My detailed look at this group’s social trajectories from a young age revealed that not all native-born descendants of Turkish immigrants experience prolonged and complex transitions. Their ability to successfully prolong their transitions and combine various activities depends on institutional structures, the forms of capital available to them through their families and the resources they develop over time in their social trajectories. This finding highlights the role of social class, placing it firmly at an intersection with ethnicity and gender. It also brings the varying conditions of different localities into sharp relief. Prolonged youth transitions are therefore not something that can be taken for granted. This book also offers some crucial theoretical contributions to youth studies and ethnic and migration studies by studying social class through the lens of different forms of capital. The analysis of the role of social class, through observing the forms of capital that are utilized in youth transitions is innovative and, more importantly, constructive in different ways. Following on from Savage et al. (2005) this study has looked at the forms of capital that migrant parents can provide, which has yielded a more nuanced analysis of social class at the micro-level, uncovering those parental resources that can really make a difference to their children’s transitions. My qualitative interviews revealed that some respondents’ parents had developed relevant cultural capital, such as practical information about how the education system in the host countries works. Also significantly impacting the young people’s trajectories was their parents’ ability to provide them with financial support and social capital, which might, for example, be generated by running their own business and developing networks and contacts along the way. Clearly these forms of capital are not identical to that of the middle-class within the comparison group, yet they bred distinction among migrant parents. The variance of such parental resources—based on their generation, origin and/or employment experience—shows that significant intra-group differences are to be found within ethnic minorities (Erel 2010). That said, tapping resources requires determining whether the forms of capital are valid resources within the institutional settings in the first place. This is in line with Bourdieu’s theory which states that forms of capital only make sense in fields wherein value is bestowed on the related resources. As shown in Chap. 1 of this book, parental cultural capital and students’ aspirations had more influence on tracking decisions in Strasbourg than in Amsterdam, where they were more often strictly dependent on grades and teacher recommendations. This finding shows that similar resources may not yield the same advantages in different institutional settings. Members of the “same ethnic group”, even if they possess similar resources, can thus have distinct experiences unique to the institutional structures in which they find themselves. The study also identified forms of capital that were specific to the group in relation to social class, gender and ethnicity pointing to that fact that researchers should remain open to the different forms of capital that are generated according to social class and gender within the ethnic community and not limit themselves to studying dominant middle-class forms of capital, as Bourdieu initially proposed. This echoes the critics of Bourdieu, including some feminist scholars (Skeggs 2004a, b; Reay 2004) and researchers of social mobility (Friedman 2016), who argue that forms of capital are a useful analytic tool, but that the study of non-middle-class groups requires a much more flexible understanding of different forms of capital. For example; the existence of a construction sector niche among the Turkish community in Strasbourg supplied social capital and employment for the young males in the community. This social capital was also utilized by female respondents who married first-generation Turks (“import grooms”) needing jobs that required no French-language proficiency. This example is not one of “ethnic capital” per se (Zhou 2005), though it did emerge from networks within the ethnic group. In Amsterdam, this resource was not available to the same extent, due to the city’s economic structure and the lack of existing niches in any sector. In addition, the altruism of migrant mothers to provide emotional and physical resources can only be understood in relation to gendered norms in the community, in which women are expected to care for the household. To enable the younger generation of women to work and study, non-working mothers and mothers-in-law often took over these tasks. This finding illustrates the importance of familial assistance in coping with increasing individualization, risk and insecurity during youth transitions (Jones 2009). The kind of assistance apparent in my study was very much informed by the intersections of gender, social class and ethnicity, as opposed to more middle-class specific resources. Perhaps the most novel contribution made by this book lies in its examination of how immigrants’ descendants develop forms of capital in their social trajectories, and how these resources influence their transitions. Previous studies have highlighted the forms of capital available to migrants and have noted how they vary within groups according to their social class, gender and the resources imported from origin countries (Erel 2010; Ryan et al. 2015). I developed this line of thinking, choosing not to limit the study to social capital or forms of capital provided by migrant parents. 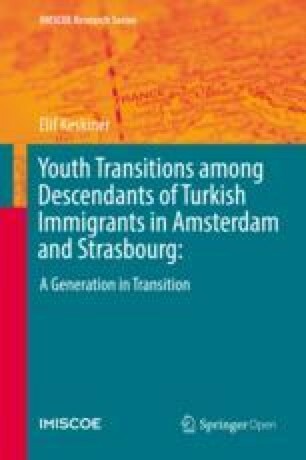 Treating transitions as a process that begins early in education and continues later into the labour market and/or other events, such as matrimony, I studied how descendants of Turkish immigrants themselves managed (or not) to develop forms of capital to help them through their transitions. This approach, first and foremost, treats descendants of Turkish immigrants as agents of their own transitions and that transition outcomes are not solely determined by parental background or structures. However, this generation of capital also needed contextualizing, both in the light of the institutional structures in which the respondents found themselves from early education onwards, and in terms of the resources they could access considering their social class, gender and ethnicity. This enabled me to show how the social and institutional structures in their social trajectories both enabled and constrained descendants of Turkish migrants in augmenting their resources. When proposing the concept of social trajectory, Bourdieu (1984) recognized the possibility for developing forms of capital, though he emphasized that the slope of development would be bound by a trajectory’s starting point—in other words, that young people are likely to reproduce their parents’ initial capital. While I observed many respondents reproduce initial disadvantages, I also uncovered others who were able to overcome this and achieve upward mobility. The assumption that the reproduction of disadvantaged status is inevitable impedes a clearheaded evaluation of the institutional structures that might also help young people to overcome their parents’ initial disadvantage. How did they overcome reproduction of disadvantage and achieve upward mobility? There the institutional opportunity structures play a crucial role. For example, access to internships and relevant part-time jobs can allow young people to hone their occupational skills and amass cultural and social capital that will ease their (future) transition into the labour market. This was particularly crucial for higher-education students who lacked access to social networks via their parents or wider family. Internship and job options were more accessible in Amsterdam than Strasbourg. Although the research did not initially intend to explore the benefits and drawbacks of combining work and school, I observed a remarkable difference between the two settings. Amsterdam’s greater array of student jobs and more flexible schooling arrangements resulted in greater participation in work-study combinations and helped young people to develop financial and social capital. Most respondents in my sample came from low-income families, and being more financially independent meant that they were less reliant on their parents when it came to their transition decisions. One of the significant findings of this study centred on the educational trajectories young people were following, or had followed and the possibility to explore whether these trajectories helped them to develop relevant forms of capital. Key findings here included whether their institutional structures provided applicable work and study combinations and the extent to which developing social and financial capital helped keep them in school. In this framework, Amsterdam provided more favourable conditions than Strasbourg: descendants of immigrants in the Dutch capital benefitted from better labour market opportunities, both during and after their school-to-work transition, and various other structures prepared them better for the tough labour market conditions awaiting them. The intersections of social class, gender and ethnicity shaped the transition processes of my respondents in a variety of ways. This book shows how youth transitions involve differently gendered motivations and pathways. Traditional gender norms prevailed in the Turkish ethnic community, more so in Strasbourg than Amsterdam. Most male respondents felt pressured to have an income from a young age, especially if they did not feel that education offered them better prospects or if their families could not support them in continuing their education. Bynner (2001) found that young men from lower-class families in the UK faced similar conditions, completing minimum education and entering the labour market much earlier than their middle-class peers. Social class background and gender thus interact to limit these young men’s options. In my study, the ethnic community’s clearly gendered values intersected with financial resources and social class. Migrant parents with successful businesses can be more supportive of both their sons and daughters prolonging their studies. Yet, institutional structures also mattered. Amsterdam’s flexible student jobs market enabled young men from low-income families to work while studying, making them less financially dependent on their families and more able to make autonomous decisions. Their counterparts in Strasbourg felt much more pressure when they sought to combine work with studying, which often led them to drop out of education and take a full-time job in the low-skilled labour market. Previous studies have shown that marriage remains, by far, the most acceptable form of union formation within the Turkish ethnic community (Huschek 2011). My study shows that matrimony is also a valid transition pathway, especially for women with few educational or labour market prospects. Premarital cohabitation is not socially or culturally acceptable within the Turkish diaspora and most young women married partners from a similar background or from their parents’ hometowns in Turkey, which enabled them to leave their parental home and transition to adulthood roles. In addition to their household tasks, many of these married young women also had to go out to work to supplement the income of their migrant husbands, most of whom had low-skilled jobs. As discussed in Chap. 4 of this book, the decision to marry early should be evaluated in the light of other transition experiences in education and the labour market. Rather than marriage being a stumbling block to further education or labour market progression, it was perceived as a way out—a door that could open up many other options. That said, other respondents who successfully prolonged their studies and found steady employment, postponed their decision to marry. Those who could rely on their families for forms of social or emotional capital were able to navigate complex transition pathways combining education, work and marriage. What does this finding imply for youth transitions field? The perception of matrimony as a gateway to adulthood or as the most conventional relationship status has undergone major transformations in Western Europe, and marriage is no longer taken as a sign of adulthood (Willoughby et al. 2015). Marriage is a ripe topic for future studies, which could examine this transition pathway’s diminishing prominence in youth transitions. Scholars, including Wallace (1987) and Bynner (2001), have argued that for less-educated women, marriage and getting pregnant are valid transitions to adulthood, offering ways to gain respect and adulthood status. Yet youth transition studies have generally ignored the conditions affecting young people from lower-class or different cultural backgrounds, instead leaving much of the work on life-course research to demographers. Decisions about marriage and union formation should be included in studies of youth transition pathways: as this book has demonstrated, since they are crucial in shaping the motivations, decisions and opportunities of young people, particularly those from different ethnic and social class backgrounds. Many of my respondents, both at school or in the labour market, were faced with the realities of discrimination and exclusionary practices. These negative experiences and fears of being excluded definitely shaped their transition motivations, as a result of which, the majority of my respondents sought stable, traditional transitions, rather than transitions that involved risk-taking or being adventurous in their educational or labour market ambitions. This observation is inextricably linked to the fact that these young people have had experiences that have made them understand the very real threat of ethnic penalties in the labour market. As the theoretical discussion of my findings has illustrated, the study’s comparative approach highlighted the impact of institutional structures and city differences on young people’s trajectories. Chapter 2 showed that while modern youth transitions are often described as “prolonged”, extending education to delay transition can be less straightforward in some settings than in others. Early stratification within an educational system conditions how long transitions can be extended. Students on academic and vocational tracks have very different possibilities to pursue higher education, and this also depends on whether they are in Amsterdam or Strasbourg. In addition, there are differences between the academic tracks in the two countries: academic stream students in the Netherlands generally expressed a clear appreciation of the returns of higher education and made smooth transitions, while in France, there were more doubts as to whether higher education was worth pursuing. The comparative design, therefore, problematized the concept of ‘prolonged transitions’ not just influenced by social structure, but also by institutions. It confirmed and illustrated how institutional settings allow, and constrain, the possibility of a prolonged transition (Côté 2014a, b). Previous studies have illustrated a distinction between institutionally designed traditional transitions and shifting or alternative biographies in which young people follow unconventional pathways (Plug and du Bois-Reymond 2006). Both in Amsterdam and Strasbourg majority of my respondents wanted to pursue stable (‘traditional’) transition pathways. Yet comparing two cities exposed how smooth transitions and traditional trajectories are uniquely shaped by settings. In Amsterdam, young people expected to, and experienced, stable careers at earlier ages, while their Strasbourg counterparts took longer to find stability in their careers. This was true for both the descendants of Turkish immigrants and the comparison groups. While majority of my respondents followed—or at least aspired to follow—stable, traditional pathways, for those who did not, their transition pathways did not always stem from their own orientations or preferences. Unlike previous studies; they were relatively unlikely to describe their shifting transitions as motivated by any desire to follow an alternative pathway. Most of their actions were not defined in the ‘moment of transition’, but earlier on, during their educational tracking or while combining work and school, depending on whether they could develop forms of capital before entering the labour market. As such, my study calls for greater attention to how social and institutional structures set—if not altogether skew—the conditions of youth transitions. Both stable and alternative youth transitions should be scrutinized in relation to social class, gender and ethnicity. While the bulk of transition studies emphasize the delay in transitioning to adulthood (Arnett and Tanner 2006), my research shows how the age of transition varies according to social and institutional structures. Social class, gender and ethnicity intersect to pressure the descendants of Turkish immigrants to achieve stability at an earlier age than their peers. Education and labour market conditions also affect the age at which these young people can achieve stability in their transition. We need a change of perspective, in the domains of both research and policy, if we are to understand the youth transitions of descendants of migrants. The detailed study of parental resources reveals that future studies need to pay more attention to social class, especially on a micro-level, in order to understand how it affects young people’s lives both in the field of ethnic and migration studies and in youth transitions research. While at first glance, many migrant parents seem to be capable of providing only limited resources due to their lower social class background, they can influence their children’s trajectories by developing or possessing certain forms of capital. This could just as easily be true of working-class parents from a native background. Future ethnographies should focus on migrant parents and/or families and explore the impact of social class by examining the forms of capital generated at the nexus of social class, gender and ethnicity. In doing so, future studies should go beyond Bourdieu’s theoretical framework and remain open to the possibility of uncovering forms of capital that may be specific to groups, localities and experiences. Furthermore, studying the social trajectories of the second generation in detail revealed that young people are not bound by their parents’ forms of capital and are able to develop resources which are crucial for their transitions. This theoretical contribution is key to understanding social reproduction and/or social mobility processes without either ignoring or over-emphasizing agency. It shifts the focus from the “agentic” aspect to the resources that agents are able to acquire within the given structural conditions. Their potential to develop forms of capital should therefore be studied comparatively, across institutional settings and with a sensitivity to variations in social structures. This approach would allow us to determine whether—and how well—countries of residence are fulfilling their obligation towards these groups to provide equal opportunities and whether certain support mechanisms—either financial or informational—are available. When discussing the attendance of young people from ethnic minorities or lower social classes at higher education institutions, we have to pay equal attention to funding mechanisms and access to student grants. We must question whether it is possible for young people to extend their transitions into tertiary education and what kinds of financial pressures they are faced with when doing so. This study made it very clear that financial concerns formed a major obstacle for young people who wanted to continue their studies. In Strasbourg, they were faced with an inadequate student grants system, while in Amsterdam they afraid of having to repay their student loan, thereby incurring a huge debt, if they failed to graduate. However, the comparative design showed how, despite their relatively disadvantaged backgrounds, members of the Turkish second generation are able to achieve successful transitions when provided with the right resources and guidance. Internships and work/study combinations emerged as significant experiences, which merit further scrutiny in both disciplines. It appears that having a student job is not just a factor that might jeopardize educational performance, but one that can also help students to develop resources for their future transitions. The implications for policy are that promoting internship programmes and dual training opportunities may not only help young people to gain early financial independence, easing the pressure on them to earn an income, but may also facilitate the development of social capital that is useful for their future transitions. In Strasbourg, the lack of sufficient dual training opportunities and the fierce competition to win a place on a dual study programme (BTS and Alternance) was revealed as a widespread concern for young people who had to combine work with studying due to financial constraints. In Vassaf’s (1983), study, the descendants of migrants from Turkey complained about “not getting their voices heard”. Back then they were complaining about the lack of opportunities, resources and exclusionary practices. After almost 40 years of research on ethnic minorities, this study also highlights that societies and policy makers could still be doing more to respond to their needs and demands. This is an urgent necessity considering the future of the European diverse societies that are home to these ethnic minority youth.